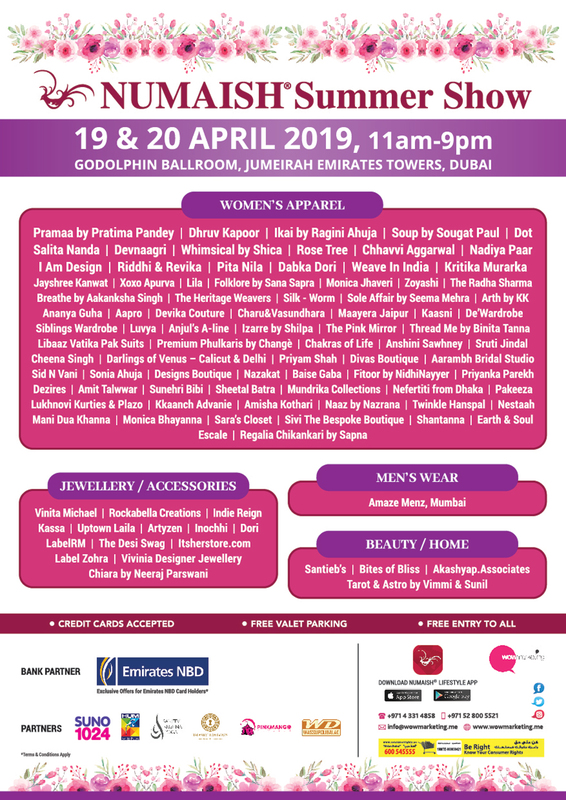 Art of Ethnicity, Minimalism and Modernism will be the Key Focus in NUMAISH Summer Show 2019 on Friday 19th April & Saturday 20th April at Jumeirah Emirates Towers - Dubai from 11 am to 9 pm. Get Ready to witness the finest fashion labels at NUMAISH this Summer which will host its 24th edition with a never seen before lining up of new & exciting fashion names from Fashion Weeks, Haute Couture Labels and our never seen before Debutant Designers. NUMAISH is synonymous with the creme de la creme in Asian fashion and are proud to introduce inspiring and creative brands from over 100 more designers in Women/Men Wear, Jewelry, Accessories & Home Decor. For more details call +971 52 800 55 21 or email to numaishexhibitions@gmail.com.